When it comes to Venice dining, most people think Abbot Kinney. But some of Venice's best finds are on the still-underrated Rose Ave, which boasts a great array of patio-driven restaurants and bars. One of those patio-driven restaurants includes Makani, a small plates spot featuring Korean flavors and inspired by LA's diverse, vibrant culinary communities. There's a big, beautiful bar inside, but we recommend stopping by for social hour (Tues-Fri from 3-5:30), grabbing a table on the patio, and enjoying $10 cocktails and discounted small plates. Though the happy hour cocktail menu is heavily focused on rum, I opted for a mezcal drink with pineapple, citrus, and habanero, which was light, fruity, spicy, and perfect for summer. Some of the small bites on the social hour menu have some major heat, like the Nurungji, a spicy eggplant dish with basil, mint, and a puffed rice chip. The eggplant was really tender, and paired well when layered on top of the crispy puffed rice chip, while mint helped balance out a bit of the spice. One of the surprising hits of the night was the crudité. Sure, it's just a plate of raw veggies, but the ssamjang (a spicy Korean dipping sauce) was definitely the star. It was sweet and not too spicy, providing a nice counterpoint fo the cold, crisp veggies. 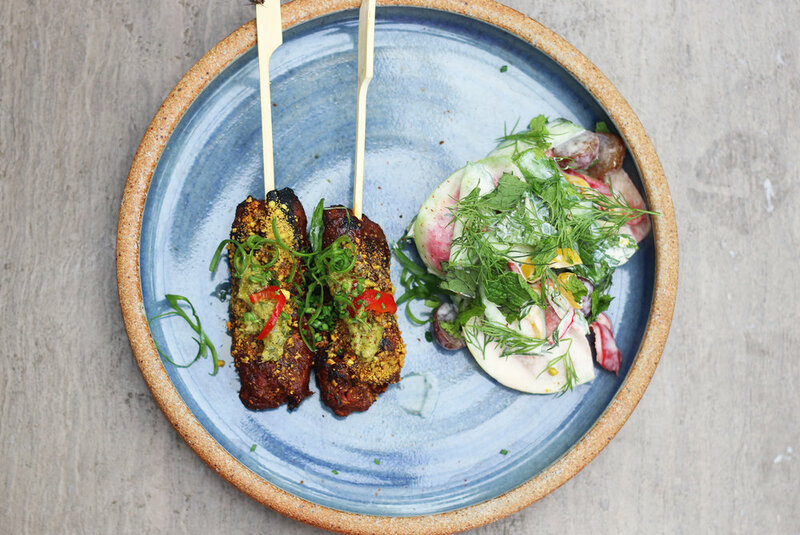 Celebrating some of LA's mediterranean flavors, the Lamb & Beef Skewers were another tasty bite. The side of pickled grapes with curry lebni provided a fresh, acidic little salad after the heavier bites of meat. 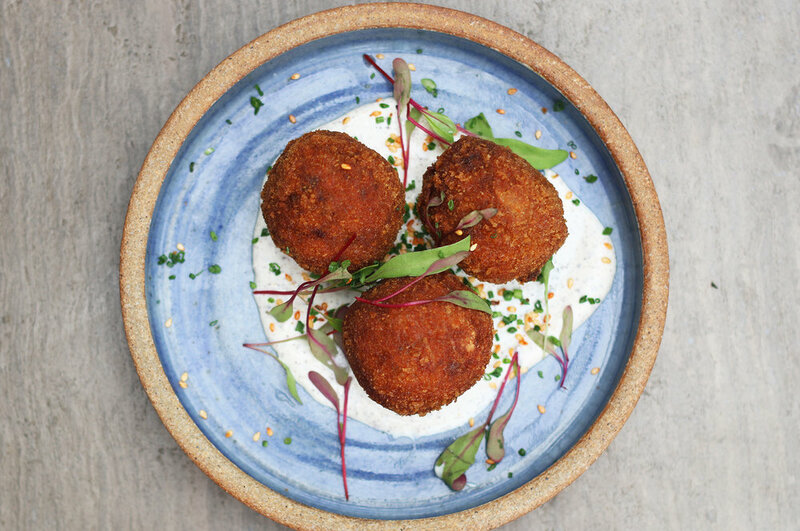 Finally, we had the Crispy Rice Balls, which are a more global take on Italian arancini. Wild mushrooms and mozzarrella enforced some of the more traditional arancini flavors, while Korean gochujang added some nice spice. Easily a favorite of the night! The Editorialist LA seeks to discover all that this creative, sprawling metropolis has to offer. With a heavy focus on fashion and food, The Editorialist LA is the one-stop shop for stylish, intelligent, and culturally-savvy young city dwellers.